8th and 9th June 2019 at Cleeve House in Wiltshire, England. Tickets are limited to 200 and are priced at £65 . ​Six years since the acclaimed WOOLF MUSIC and once again held in the imposing manorial setting of Cleeve House in Wiltshire, the former home of the extended Virginia Woolf family, Woolf II – A Terrascope Celebration represents a gathering of musical friends, old a new, each one beloved of the august and ever-discerning Terrascope. The event might be seen as a more stately, compact version of the much loved and hugely influential Terrastock festivals that criss-crossed America during the 1990s and 2000s. Talking of old friends, we have a couple of acts playing the Saturday who we affectionately refer to as House Bands even though they are likely to be horrified by the very thought. THE BEVIS FROND have been there from the start, Nick Saloman having published the venerable Ptolemaic Terrascope magazine so expertly and lovingly edited by our very own Phil McMullen, still of course very much at the helm of the current online incarnation. Nick, and his most stable (in all senses) of line-ups have a brand new album out that oozes with the effortless not to mention timeless mix of exhilarating psych rock and tuneful balladry. THOUGHT FORMS also seem to have been around forever and can literally lay claim to the house band mantle, their formative line-up having learnt their chops rehearsing in Phil’s spare room (god bless thick sandstone walls and tolerant or deaf neighbours). 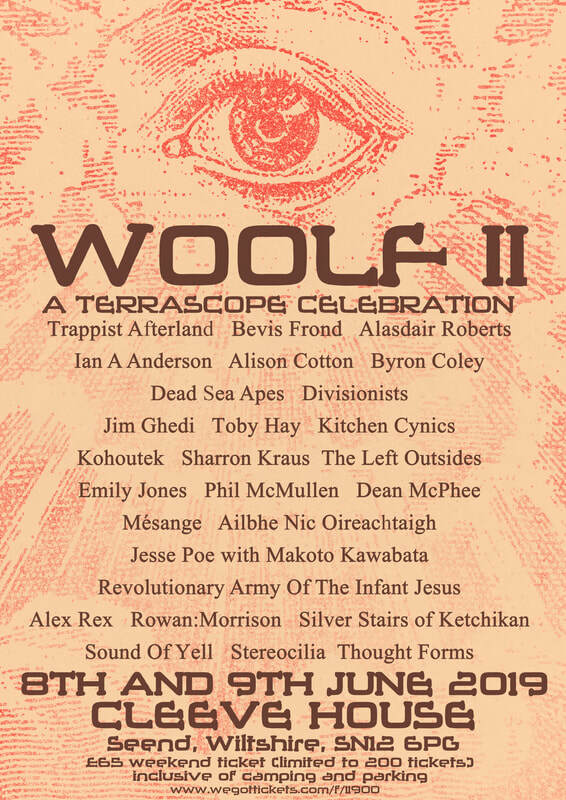 Woolf II will be part of a series of three extra special performances they're doing to celebrating the tenth anniversary reissue of their first album on Invada Records. We can’t wait. Completing Saturday’s noisy triumvirate will be our favourite exponents of gripping instrumental soundscapes, Manchester’s DEAD SEA APES. Other hardy perennial Terrascope stalwarts on hand will include a couple of former Abunai! ex-pats who now comprise one half of London power poppers DIVISIONISTS, the resurgent psych-folk duo THE LEFT OUTSIDES and New York via Leicester and Sheffield chanteuse SHARRON KRAUS who will be bringing her band along for company. There’s a strong Caledonian element to this WOOLF line up. As well as the mesmeric KITCHEN CYNICS we’ll need to keep a watchful eye on ALASDAIR ROBERTS, ALEX REX (featuring the multi-talented Alex Neilson), SOUND OF YELL and AILBHE NIC OIREACHTAIGH all of whom will be playing jointly and individually. As both Alasdair and Alex will also be coming off the back of new albums (and in Alex’s case hot off a first Alex Rex tour) this promises to be a mouth-watering segment of our Sunday programme. Terrascope has long championed nimble fingered guitarists – Robbie Basho, Jack Rose and Glenn Jones amongst them - and so we are delighted to welcome TOBY HAY and JIM GHEDI, young hotshots both, and whose Hawksworth Grove Sessions of 2018, as well as their hugely impressive solo albums this year, point to a bright feature for them and indeed the seemingly endangered stringed plank instrument. Those craving slightly more esoteric and mystical fare need look no further than the enigmatic and usually elusive REVOLUTIONARY ARMY OF THE INFANT JESUS, whom we’re immensely honoured to have enticed out of hiding for a twilight Saturday performance, while rising stars MESANGE bring a bracing solemnity to the Main Hall on Sunday evening, the perfect setting for the potent and majestic interplay between Agathe Max (violin) and Luke Mawdsley (guitar). ALISON COTTON’s All Is Quiet at The Ancient Theatre was one of the most revelatory releases of 2018 and we are delighted that the Left Outsider has agreed to perform one of her infrequent solo sets and which is sure to pack more atmosphere than a small planet. Other solo performers who will be facing what in all likelihood will be a most benign and receptive audience range from EMILY JONES, SILVER STAIRS OF KETCHIKAN, DEAN McPHEE and STEREOCILIA (surely the closest thing to a purely instrumental Flying Saucer Attack). And speaking of the disarming Emily, we are also joined by her old collaborator Rowan Amber Mill who with Angeline Morrison will perform as ROWAN:MORRISON and will no doubt showcase their exquisite new “pagan folk” album In The Sunshine We Rode The Horses. So far so frightfully British for the most part. However, our globalist reputation remains undiminished as we also welcome from the US of A, KOHOUTEK and JESSE POE, who will be joined by Acid Mother’s Templar MAKOTO KAWABATA from Japan, while Australia is represented by the spiritual wonder that is TRAPPIST AFTERLAND. ​Other than that we will have a People’s Free Stage for anyone who wants to get up and have a go, which isn’t quite as speculative as it all sounds given that many of our friends are musically inclined and adept to boot. Which kind of rules out that other “House Band” the McMullen-Fraser Comb, Paper and Ukulele Aggravation, no doubt much to the relief if not celebration of a grateful Terrascope family. 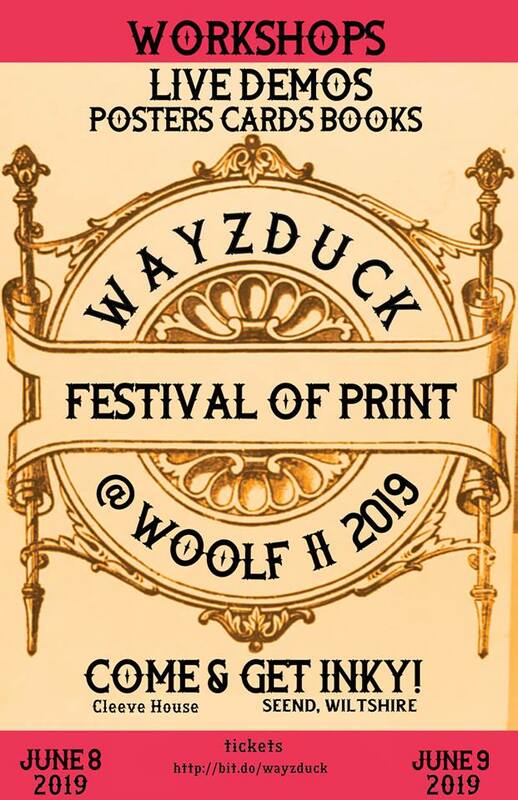 If all that isn’t enough then this time Woolf will be hosting a Print Fair, a festival within a festival that brings Phil’s love of music and printing together in one special place. Featuring workshops and demonstrations of letterset and screen printing, there will be plenty of chance for you to all get down, get hands-on and get downright inky.